It's been a little quiet over here in FFT-land, as I took advantage of the holidays to plan a family trip through the South. We flew into Memphis, where we spent a few days before driving to Nashville, then to Louisville before flying home. These were all towns I've wanted to visit, and with a week free, we were able to get to all of them (and then some). I told the kids before we left: "I hope you like BBQ, fried chicken, bourbon and the blues, because there's going to be a lot of them." And there was. We did some good eating, and had a couple surprising disappointments too. Anyway, to catch up and fill in some blanks on the "best thing i ate last week," I'm going to backtrack to the second day of our trip, when we visited Hog & Hominy in Memphis, where chefs Michael Hudman and Andrew Ticer do Italian-style cooking with Southern-style ingredients. On Sundays they offer a "Sunday Funday" menu all day which is mostly pizzas and brunch-type items, and the best of them may have been this "Thunderbird! Forty Twice!" 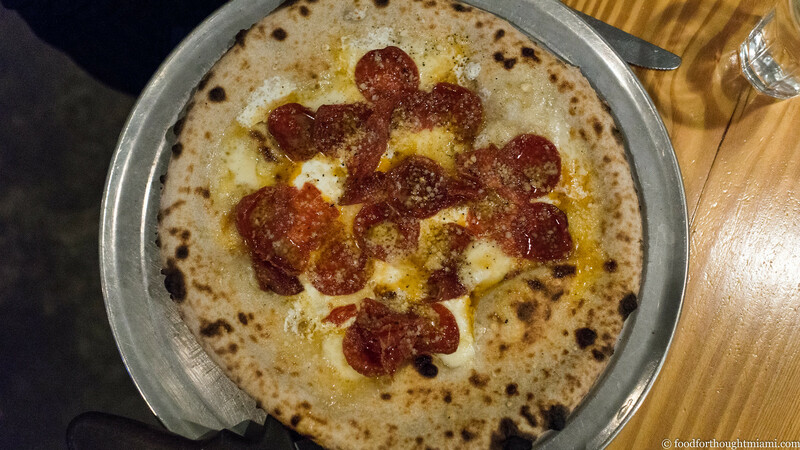 pizza, topped with fontina, mozzarella and parmesan cheeses, thin-sliced pepperoni and a drizzle of spicy honey. A puffy, chewy crust with just speckles of char, a balance between crust and toppings; a great interplay of spicy, cheesy and meaty with just a touch of sweet. Mrs. F regretted not ordering a second one. (You can see all my pictures from our dinner in this Hog & Hominy flickr set). Runners-up: these lady peas with guanciale and chicken liver mousse from the same meal; a supremely satisfying fried oyster poboy from Kelly English's New Orleans' themed Memphis restaurant, The Second Line; some delicious Delta style hot tamales from Mose Tamale truck, spotted in a gas station parking lot on the way between the Memphis airport and Graceland.